Geek Lit Etc. : Manga Monday: Can a naive girl help a young man reclaim his title? Manga Monday: Can a naive girl help a young man reclaim his title? 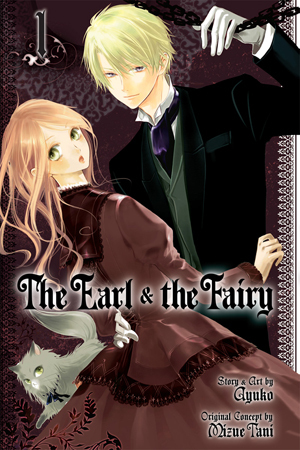 As the world forgets about the magical, those that bridge the two are left behind in The Earl and the Fairy Volume 1. Miss Lydia Carlton is a fairy doctor. Able to see fey folk when most humans cannot, she learnded to help the two live together peacefully from her late mother. She treasures the time they spent together, and as soon as she was old enough, she put up her shingle and opened shop. Unfortunately, Victorian Britain has no place for fairies anymore. Ad science gains traction, fewer and fewer people believe in creatures they can't see, and business isn't what it was a generation ago. More and more people are starting to wonder about the girl with the red hair and green eyes that talks to the air. On a trip to London to visit her father, all this changes. After some very frightening situations, she ends up in the employ of one Edgar J. C. Ashenbert. He is the rightful heir to the legendary Blue Knight, but as a child he lost his title and the Merrow Sword that would prove his lineage. He's willing to do whatever it takes to reclaim his rightful place, but he needs someone like Lydia to facilitate his dealings with the fey. Lydia has one being in her corner. There's a fairy called Neco who plays the role of protector to our too-trusting Lydia. While normal humans see him simply as a cat, he can speak perfect English to Lydia and can write, too. While he plays the cat in public, he demands to be treated as a proper gentleman by those who know his true nature. There's quite a lot going on here, and it's easy to get lost. Raven and Ermine, with the names of common animal familiars, are almost certainly more than they appear. The ability that Lydia and her mother have to see fey isn't explained. But some shojo readers wouldn't be tolerant of the slow build that other audiences expect, so we're tossed into the thick of things. Still, the premise is promising, and with light novels, a visual novel and an anime as part of the franchise, there's certainly promise here. Highs: The reaction of the mailman when Lydia starts scolding the fairies on his mailbag is priceless. Lows: It's hard to tell where the plot is going at first, but things get cleared up a bit eventually. Verdict: A guarded recommendation, at least to see where we go in Volume 2.